Deliciously flavorful smooth Bavarian Cream with real vanilla specks. 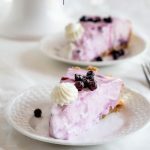 Topped with an easy Blackberry Coulis and real whipped cream for a real show stopper! I made a mistake in the kitchen. One of the most amazing mistakes ever! I wanted to make a bavarian cream filling for a post that had been rambling around in my head. Well, the further I got into it, the more that I realized that this recipe wasn’t suited for a filling. It was a stand alone screaming on the top of the mountain prima donna. The recipe that was floating in my head took an immediate back seat to this dish. Talk about a delicious, melt in your mouth, cream with real vanilla specks. The Blackberry Coulis tops this dish with a burst of fresh fruit richness, and dresses up the dish elegantly. This isn’t one of those desserts that is sickly sweet thats good on the first taste, but goes downhill from there. No, this lovely concoction is delicious to the very last bite. Mistakes like this are what keep me in the kitchen. Deliciously flavorful smooth Bavarian Cream with real vanilla specks. 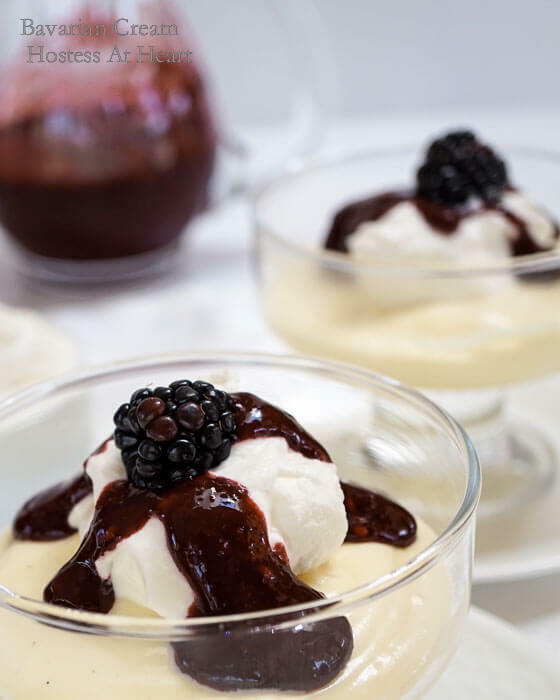 Topped with an easy Blackberry Coulis and real whipped cream for a real show stopper. In a saucepan, add cream. Split vanilla bean and scrape seeds into cream. Drop the bean into cream and bring to a boil Turn off the heat and let sit for 1 hour. Discard pod. Sprinkle the gelatin into the milk and set aside. Whisk the sugar and egg yolks together. Warm cream mixture back up and slowly whisk into the egg yolks. Place this mixture over simmering water and stir until thick enough to coat the back of a wooden spoon. Remove from the heat and add milk and gelatin mixture. Place mixture into an ice bath and bring to room temperature. Whip heavy cream with an electric mixer and add sugar until soft peaks form. Fold 1-1/4 cups of whipped cream into cream mixture. Reserve remaining whipped cream for topping. Pour into 6 dessert dishes. Cover with plastic wrap and refrigerate. Allow to chill 4 to 5 hours. Place blackberries into a blender with sugar. Blend until smooth. 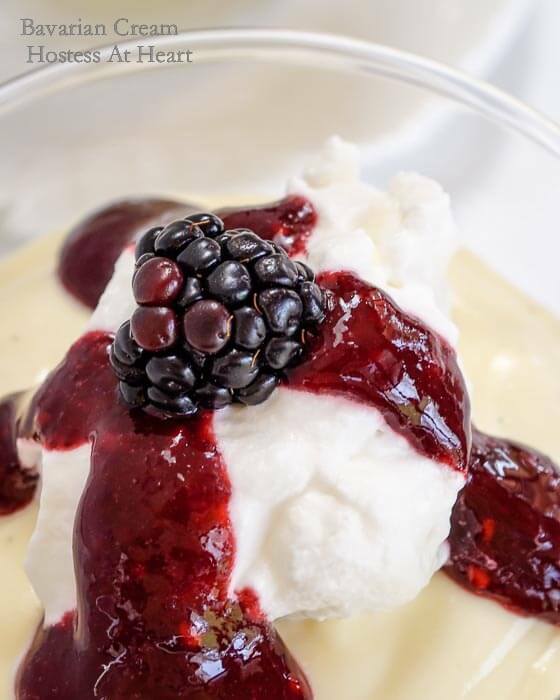 Top bavarian cream with whipped cream and blackberry coulis and reserved blackberry. Oh my gosh is this ever lovely! Beautiful post, Julie! Thank you! It was delicious and so pretty on my table. Thank you skd! Hope all is well and that you have a great day! I haven’t looked into it yet, either. Some day I hope to! Let me know if you do. Maybe we could meet up! I will. That would be fun! I would be happy to be your foodie buddy! 🙂 I don’t know of many around here either. Have you ever thought about going to a blogging conference? Yes, but I haven’t looked into it yet. You? I wish we lived closer so you could throw all your mistakes my way, Julie! I would take care of them for you! 🙂 I love anything with cream or real vanilla bean in it, so I know I would love this. The berry sauce makes it so beautiful as well. Definitely saving this to make. Thanks for sharing your happy accident! Thank you Shari! I wished you lived closer too! 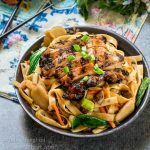 Would you believe that there are very few food bloggers around here or people that just like to get together and cook or bake? I could use a foodie buddy. 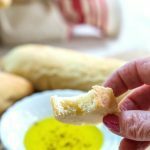 I love when a recipe takes a turn for the worse, but it is really a blessing in disguise! I have never really made a great cream before so I am interested in trying your recipe! 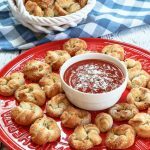 Thanks for linking up to Saucy Saturdays! oh wow. That is pretty much the perfect dessert. I’ve never had Bavarian cream before. I need to read up on all the different creams and puddings. There are so many! Some taste testing may be required 😉 Thanks for linking up at #SaucySaturdays. Thank you Christine. My husband loves Bavarian filled pastry but this is what he got. It was delicious. I am sure you do. You are an amazing cook! Thank you! You are always so sweet and I really appreciate your support! Thank you! It wasn’t difficult but new for me and very yummy. I wish all my photos would cooperate. Some days is just a fight as you know. Thank you Loretta! We are always happy but enjoy some more than others right? Enjoy your holiday too! Julie, this looks wonderful! I love blackberries, too! Thank you Anna! It was yummy. Oh my gosh – this is so beautiful. I’ve never made Bavarian cream – but it’s on my list now. Wonderful! You are so darned sweet. Thank you so much Lindy! Sounds like a pretty great mistake! I think my mum used to make something like this and it was indeed delicious – I can tell yours would be too. And the coulis looks great as well. Thank you Judi! It was so yummy and definitely a treat. Thanks Jhuls! That is my husband’s favorite donut flavor too so I knew he would love this one. Thank for co-hosting! Thank you! It was really delicious. One of my husbands favorites! Julie, I love when a mistake turns out alright!! And, what a great use of blackberries. The pictures are simply mouthwatering. Happy FF, and I hope you have a wonderful weekend! What a delicious mistake this was 😉 It looks heavenly! Thank you Sarah! My son said it’s the recipe he uses to make tiramisu. Who knew? I want to make mistakes like you do, Julie! What a delicious concoction! Thank you! It sure was an amazing dish. I could go for that dessert. Great for company too. Thank you! I did serve it to guests and got the response “you made this?” Very satisfying! Thank you Freda! It is very good, and just a treat for once in a while. I enjoyed the clicks too. Sometimes they are just better than other times you know? Yes Julie ! Can totally relate to you ! Sometimes it’s hard to pick out one good picture , sometimes you have plenty of them ! The subject truly matters . Thank you! This is more of a pudding and doesn’t get frozen. The coulis is delicious on ice cream though! A decadent and delicious mistake. Gorgeous too with the blackberry coulis. I agree Ana! Thank you! Wow! I was trying to figure out what to do with my blackberries. This looks great! Thank you! 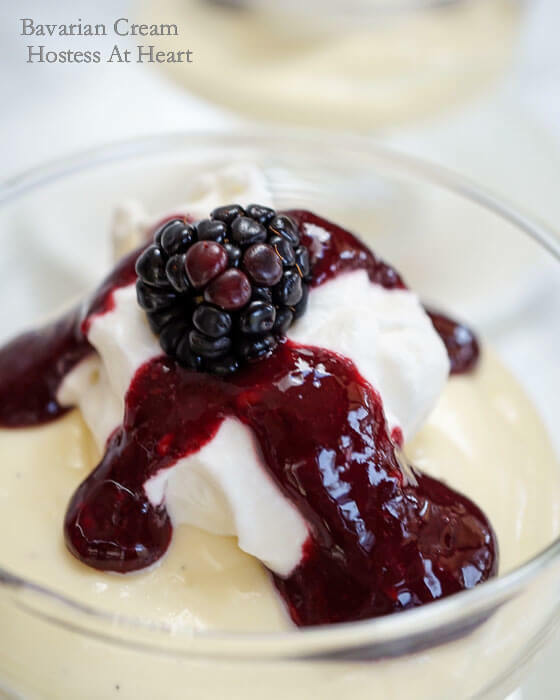 I put that blackberry coulis on yogurt when the bavarian cream was devoured too. I just love blackberries! I’m not sure I’ve ever had Bavarian Cream. Looks good! Thank you Debbie! It is so delicious. Tastes even a bit fancy. I love Bavarian Cream, when I was in school I took Home Economics and Bavarian Cream was our final exam. It’s fun to make and delicious and I love with the blackberry coulis.